Jumpline Review 2019: Is Jumpline a Good Hosting? Jumpline is a premium U.S. based hosting solution for individuals or small-to-medium businesses with shared, VPS, and cloud hosting needs. Their partner, Expedient, provides multiple data center facilities along with the best software and add-on features. Jumpline is a U.S. hosting company based out of St. Petersburg, Florida. Having been around since 1997, this extremely experienced service provider currently provides more than 150,000 businesses and individuals with their high-end hosting needs. Through a partnership with server infrastructure provider Expedient, they can provide their customers with access to multiple Tier 1 and 3 data center facilities across the U.S. for increased availability and performance. Cayan Payment Processing: A highly secure and trusted payment processor with more than 17 years of experience. It allows you to easily set up a merchant account with a secure payment gateway and specialized support. Protection ID: A service that hides your personal information from showing on WHOIS search results, thereby disguising your hosting email address and preventing unwanted solicitation. SiteLock Security: One of the most popular and reliable security suites for web hosting. It provides powerful malware scanning and removal, blacklisting, spam monitoring, and vulnerability scanning tools. Server partnerships with huge names like Dell, cPanel, and Expedient allow Jumpline to provide premium software and hardware. Their PowerEdge pure SSD storage-based servers offer Tier 3 redundancy with multiple locations interconnected by a 10Gbps line for ultimate peace of mind. 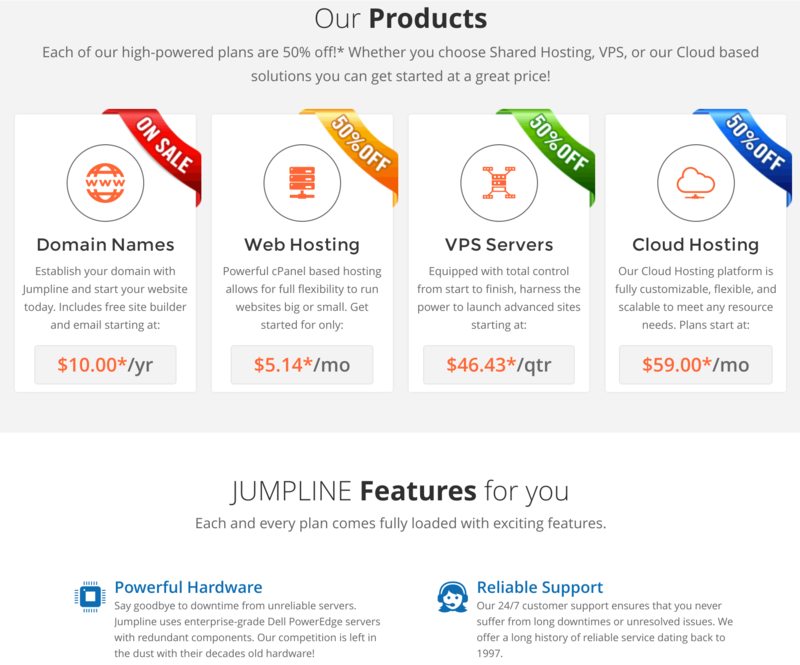 Jumpline has straightforward hosting products for shared web, VPS, and cloud-based hosting. They don’t offer money-back guarantees and they aren’t the cheapest, but they do provide a professional and contemporary service. A few unlimited options would be nice to see, but the following scalable cloud and VPS hosting options are very satisfactory. SSD Cloud Hosting quotes are generated on a per-order basis. They come with high levels of redundancy, regular backups, are instantly scalable, and have flexible billing terms. Although 24/7 technical support is provided with all hosting products, this is only via email/ticket, and phone support is limited to within office hours on weekdays from 9 am to 7 pm ET. The knowledge base isn’t comprehensive by any means, but the most important topics are covered by sufficiently detailed up-to-date articles. For businesses or individuals located in the U.S., Jumpline is a great option for highly-available, high-performing worry-free servers. Thanks to strong infrastructure and software partnerships, you’ll always have access to the best features. Wondering how Jumpline stacks up against other Web Hosting companies? Enter any other Web Hosting company and we will give you a side-by-side comparison.